With 130,000 inhabitants, the capital of Switzerland is the country's 4th largest city. Bern was founded in the 12th century, then destroyed by a disastrous fire in 1405 and rebuilt in the Renaissance style. Most of these buildings still stand today, making Bern one of Europe's leading examples of urban development during the late Middle Ages. The old town has 6 km of covered arcades, the longest medieval shopping promenade in Europe, inviting tourists to stroll and shop at a leisurely pace. The wide 17th century residences with their jutting roofs and painted facades reflect the historical pride of the Bern citizens. The entire city center, which boasts eleven historical fountains, has been declared a World Heritage Site by UNESCO. Only a few kilometers to the west to the city a very different event took place: in Zimmerwald near Riggisberg the Third International was founded in 1915 in the presence of Lenin and Trotsky, which led to the creation of the Soviet Union. 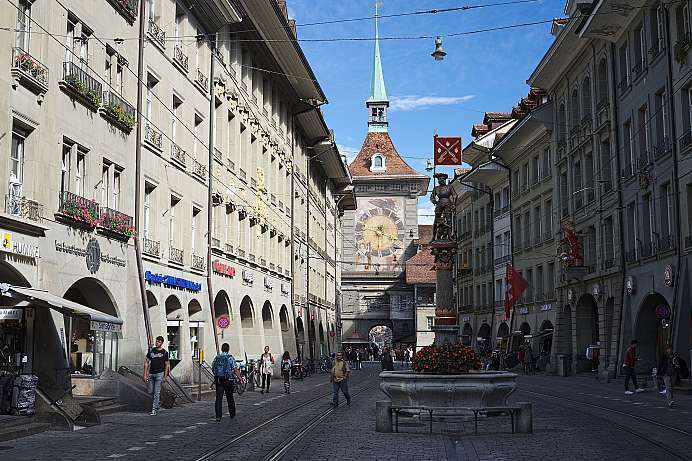 The main axis through the historic center of Bern is the Gerechtigkeitsgasse (Justice Street) which extends into the Kram-, the Market- and the Spitalgasse. With its patrician houses on either sides of the street and also the arcades, behind which hide upmarket shops, it forms a unique ensemble. The long promenade is dotted with artistically decorated fountains of which the Justice fountain from 1543 is the oldest. At the end of this typical Helvetic boulevard is the “Zytglogge” with its astronomical clockwork. In the 13th century the Clock Tower served as the western city gate.